Fisherman and I have been "off the rock" for almost 2 weeks. In that time he has been driving our "life" down the Alcan 2800+ miles and has done so with steadfast conviction armed with our camera to capture all the beauty of the trip. Our truck was loaded to capacity, in fact our short jaunt from disembarking the ferry to Anchorage was brutal - I thought Fisherman was going to have to whip out a can opener and peel me from the truck with the jaws of life. Literally, every square inch of our truck had stuff, stuffed. I am truly grateful that Fisherman is able to do this and YES, he did see some amazing scenery, lots of bears, and actually did see "the forrest for the trees"...ha! Upon arrival in Anchorage a new phenomenon has emerged...repatriation. In short, though we were only on the island for 9 months, there are now some routine things that are ingrained in my head and I am not shy to say it has made re-adjusting to civilization somewhat hilarious. One afternoon in Anchorage, our Best Man was having a dinner at his house when we found ourselves at Fred Meyer in search of some grocery items. Fred Meyer, for those unaware, is like Target on steroids. Fisherman stated, "you go find what you need, I'll grab what I need and then we'll meet at the checkout..." Well, 30 minutes later (and more than a little frustrated) Fisherman finds me wandering up and down the aisles with a dazed expression completely overwhelmed by all the choices. I sheepishly looked at him and said..."I have no idea how to shop like this anymore." I was literally drunk on the wide variety of items in the store and wanted to touch and hold all the fun home goods (I'm sure my basket was loaded with numerous items that made no sense). I also had to get it out of my head that I didn't need to stock up for the Apocalypse or wonder how we would get our shopping loot "back to the island". And to top it all off, I have actually had to re-learn how to carry my wallet with me...which I did not do the ENTIRE time on the island. Finally, I have found myself (after I re-licensed my car in the Lower 48) driving around just to drive. I will drive through a drive through and just order a pop, because I CAN - with the radio tuned to any one of a dozen stations that play music - truly a wonder! Denali, Seattle, Albuquerque, Townsend or BUST! I have been wanting to write about our final days in the Great White North. We left the island with fireworks and happy dances a plenty and have spent the last couple of days in Anchorage (Palmer) and then spent two glorious days in Denali National Park. I recently remarked on my husband and his many wonderful qualities, but one of his true gifts is making sure I get to experience all the wonder that this bountiful country has to offer. I would have been completely content to stay and hang out in the Anchorage area after we disembarked our sea voyage exodus (more on this later). He, however, wanted to make sure that I saw Alaska for its real beauty and not just the dysfunction of the island (beautiful, yes...functioning NO WAY). The other side of that gift is his ability to plan out a short trips and making the most of the beauty of the land and see to every detail of short day trips. We set out Wednesday afternoon and headed the 180 or so miles to Denali. Along the way we made time to stop at Montana Creek (of course) as well as to take rockstar photos of Mt. McKinely. When we finally arrived our destination for the evening Fisherman had made reservations at McKinley Creekside Cabins for the night. This place was amazing, totally my definition of a charming bed and breakfast - with super comfy beds. We drove a little ways past the B&B to have dinner at Prospector's Historic Pizzeria and Alehouse (SO MUCH FUN and really good pizza). The next morning we mounted our trusty steed (the Dodge) and headed to our tour bus which took us up into the park. This was definitely a "bucket list" type of a trip. We saw...caribou, ptarmigan, moose, big-horn sheep, and BEARS...um yeah, BEARS! The scenery was amazing and to learn of the fabulous history and the unique landscape of Denali was sheer joy. The trees for instance, do not grow very tall in Denali because of the distorted daylight and altitude. They looked like trees straight out of a Dr. Seuss book - super skinny and about 8 feet tall. I kept waiting for a Whoville Who to pop out! Like I said, the trip was amazing and packed with adventure which is the definition of Mr. & Mrs. Seiler during their first year of marriage. If you would like to see photos of our trip and even some cute selfies of Fisherman and I...check back. I will post link to a viewable album later. Tomorrow I board the plane bound for Albuquerque via an overnight stay with my sweet sister-in-law in Seattle...cheers and more from the "Lower 48" later. Tomorrow by this time, Fisherman and I will drive our little wagon down to the dock and with tickets in hand, board the ferry off this island. Our experiences here in Sand Point have been truly unique (to state the very least and the very obvious). I have learned many lessons this school year and have been very much in a reversed role - learning as much from my students and those around me, as they have from me. I have taught my students how to blog, how to write personal narratives, how to write persuasively, , and finally how to construct a literary analysis that would make your socks melt! Whew, I'm tired just thinking about it! The real lessons I learned, however, outweigh even the hefty list of literature. My most important lesson was learned in my own home. I learned how to be married to my husband. I learned, thanks to our remote location and removal, to depend on another human being. I learned that when things get sketchy HE is my sunshine. I learned how to be his wife. We had each other here on this island. That. Is. All. We were surrounded by people, but it was truly as if we had landed on the moon. EVERYTHING was different. I was forced to leap outside of my comfort zone. 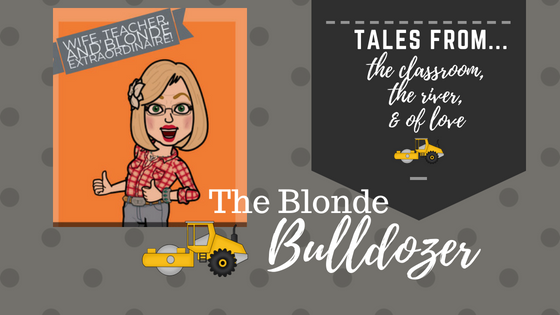 This blog is aptly entitled "The Blonde Bulldozer". I am headstrong, fierce, and have rarely been afraid of trying new things. But, this place, is tough. Being in this climate, these surroundings, among some of the toughest people in the world, I had no other choice but to cling to my husband - the only other "like-minded alien" around. My husband is my hero and truly a man who lives his vows to his wife, daily. Love, even when he doesn't really like me or my oddities. Honor - finding ways to honor my individuality while leading me to be a stronger human being. And finally, cherish...any man who will sit in a car whilst his wife is getting a manicure, haircut, all the while bringing her a fountain soda and dries her tears as she sobs at the possibility of not going home for Christmas, has learned and earned these lessons, ten-fold. So, as we embark on our next adventure and load our truck and vagabond our way down North America to heaven knows where, I am firmly fixed in my love for Fisherman and await with baited breath our exodus. I know it has been a very long time since my last post. In the interim a little explanation of our life. Fisherman and I have been working our hardest to try to make sense out of the chaos that is life here at the Sand Point School. I have highlighted many of the unique tales, but a full expose would not be appropriate to blast all over the web. Suffice it to say that Fisherman have dedicated a large amount of time in the last month job searching - with all that it entails. We attended the Alaska teacher job fair in the middle of April and felt as if we made some good contacts, but like most states, the legislature determines the fiscal future of the districts in Alaska. We thoroughly enjoyed our escape from this rock and had some fun staying in a very nice hotel...but as of yet, still nothing from an Alaskan school district. We have also been filling out applications and sending resumes/CV's in hopes of possibly returning to the southwest, or possibly moving to Wyoming (the pay for educators is very good), maybe Washington...or wherever we would have gainful employment. I will not shy away from saying that I am disheartened by the underwhelming response. I think if one would ever like to know their worth try applying (over and over again) for a teaching position - a person MUST be made of stern stuff; it is brutal out here, peeps! Insert segue here. On a different note, our escape from this rock is 5 days away...F-I-V-E! 30-second happy dance followed by a shimmy! My beloved Fisherman and I will be making our getaway via the Tustamena, the ferry up the inland passage. I have never traveled by ferry so this will be an epoch in my life and one I am very much looking forward to. I am not gonna lie...after the ferry in Japan I was a little nervous. Advice we have received prior to our travel. Make sure to book a cabin so you will not have to sleep on deck in a sleeping bag. One of our favorite colleagues said that is how she and her husband came out to Sand Point, but they didn't have a cabin and they "toughed it out" camping on the deck. My thoughts were "THAT'S CRAY CRAY, wrapped in a whole lotta NUTS!" I love camping and outdoorsey stuff, but seriously, this is the Aleutian Island chain peeps, the weather out here is NO JOKE. Long story short, WE DEFINITELY HAVE A CABIN! Have your cameras ready. The sea really is a living-breathing entity and we should have ample opportunity to see a wide variety of sea life - whales, sea lions, otters, seals, etc. I cannot wait! There have been many who have weighed in on the motion sickness aspect of our trip. To medicate, or not to medicate, that is the real question. Lastly, the littles have been telling me all about the cuisine on the ferry. Needless to say, I cannot get an accurate report. Therefore, I will be making a dearth of breakfast burritos, chocolate chip cookies, and stocking up on apples before we board. I will post as we travel, but for those who would like to "track" us...here you go.